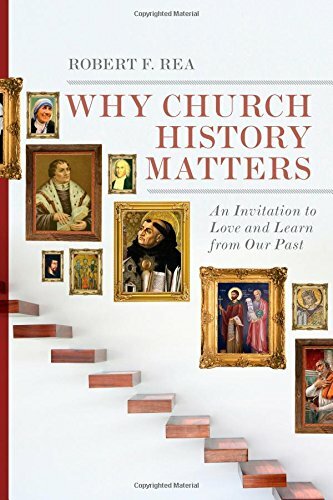 An Invitation to Love and Learn from Our Past is the descriptive subtitle to Robert Rea’s book Why Church History Matters (henceforth History Matters). A professor of church history at Lincoln Christian University, Robert Rea writes History Matters, to answer important questions such as “If the Bible is God’s revelation, why spend time studying the history of the church’s teach and practice?” as well as “Why should I care what Christians in other times and other places believed and how they acted?” (14). For many Christian traditions the church’s history matters immensely (e.g. Eastern Orthodox, Roman Catholic and Anglican, 60-69). Thus Rea’s target audience throughout History Matters is “Bible-focused Christians” (17) who have a tendency “to de-emphasize or ignore the history of the church” (18). This audience influences the entire flow of History Matters. Rea covers introducing definitions for church traditions and historical perspectives (part 1), motivating study of church history for accountable Christian community (part 2) and pinpointing particular ways church history helps in modern ministry (part 3). Although Rea demonstrates that “Bible-focused Protestants” have not always ignored tradition (70-74), History Matters contains multiple challenges to said contemporary communities that “have all the ingredients necessary to find themselves in a loss of real Christian community” (98). In this, Rea emphasizes the strong individualism and contemporary nature of exegesis (the presumed superiority of historical-grammatical). Rea points out the tendency of conversion oriented communities to glorify “personal experience” (98-99) to the present church community’s detriment, as well as hindering its relationship with Christian community of the past. Part 2 of History Matters address this issue with two excellent chapters on “Accountability Partners” (chapter 6) and “Mentors and Friends” (chapter 7). In Part 3, Rea spends a significant amount of time on the relationship modern exegesis and interpretation has with the church. History Matters provides a hermeneutical overview and practical reflections on the nature of historical-grammatical approaches used by scholars and pastors alike (chapter 8). This is all done to encourage and challenge Bible-focused Christians to learn from church history. In conclusion, Why Church History Matters is a good volume on the importance of studying church history. Its maximum exposure should be in the evangelical, Bible-centered churches filled with pastors and laymen without a sincere appreciation for church history. Thus Why Church History Matters makes a fine book for Bible study, classrooms and private study. That being stated, Robert Rea provides few new concepts, intentionally, for individuals coming from traditions that admire and respect church history. Though encouraging, individuals convinced of history’s importance would be better served reading a thorough recounting of church history.